A broken garage door spring is one of the most serious garage door problems you might encounter. With broken springs, you often can’t even raise the door manually. You may feel trapped in your garage until the problem gets resolved. 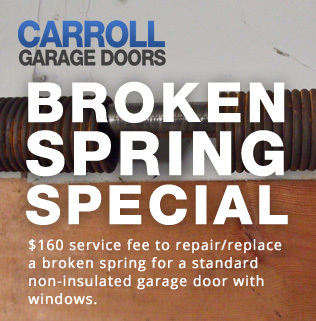 Fortunately, you can call Carroll Garage Doors for fast and efficient garage door spring repair Simi Valley CA. Whether you have a custom door or a brand name door, a broken garage door spring is not a good thing. In two-spring systems, uneven wear on the springs can cause the door to move unevenly, potentially warping the opener tracks or even damaging the door itself. Depending on how heavy your door is, you may not be able to open it without a functioning spring to provide lifting power. Getting trapped in your garage by a broken spring can be extremely frustrating. Carroll Garage Doors can provide inspections and preventative maintenance to help prevent these things from happening. Our skilled technicians will look at the springs and recommend replacement as soon as they begin to show dangerous signs of wear. While springs are probably the most critical part to replace early, we can also replace any other worn parts of the system that may be revealed by the inspection to give you superior garage door performance.